Drawn by the mysterious mount Etna, Thomas Meyer sets off on a quest to discover the secrets of the Mediterranean islands of Sicily and Stromboli. The Sicilian region is not only famous for the drama of its live volcanoes, but also for its associations with numerous cultural figures – ranging from Cain, Empedocles, Klingsor and the much maligned Cagliostro, through to Goethe and Rudolf Steiner. The author ponders their lives, work and karmic connections, whilst unexpected meetings with cryptic strangers result in discussions that are filled with spiritual insights and pearls of wisdom. 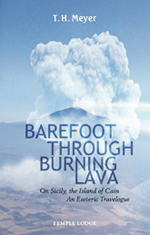 Meyer’s travelogue is at once engaging, poetic and deeply esoteric, drawing parallels between the burning lava of Etna and Stromboli and the soul lava through which our spiritual feet must wade in the present day. In meditations on the Guardian of the Threshold and the explosive popularity of football, we are led to the conclusion that today human beings need to develop ‘spiritual feet’ to cross the boundary to higher worlds. The author’s final trip coincides with the recent natural catastrophe in Nepal, which prompts him to ask whether humanity can begin to take inner responsibility for the many such disasters – particularly earthquakes and volcanic eruptions – that take place around the world. For these natural calamities, says Meyer, are intimately related to our untamed passions and emotions. T.H. MEYER was born in Switzerland in 1950. He is the founder and publisher of Perseus Verlag, Basel, and editor of the monthly journals Der Europäer and The Present Age. He is the author of several books including Milestones; In the Sign of Five; Ludwig Polzer-Hoditz, A Biography; D.N. Dunlop, A Biography; Rudolf Steiner’s Core Mission; The Bodhisattva Question; Clairvoyance and Consciousness and Reality, Truth and Evil. He is also the editor of Light for the New Millennium. Meyer has written numerous articles and gives seminars and lectures around the world.